The Nokia Asha 501 was launched minutes ago at the Nokia press event in India, where we are covering the event. Here we will be comparing the Nokia Asha 501 against the previously released Asha 311. 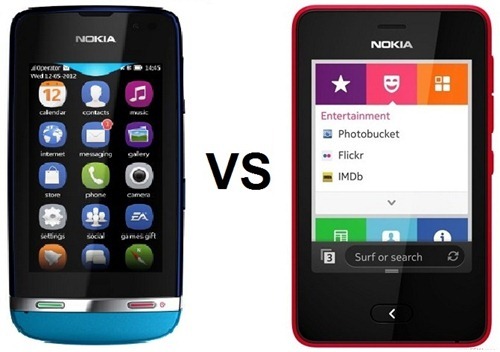 First, lets summarize the specifications of the Nokia Asha 501. The Asha 501 will be made available in two variants – single SIM and EasySwap Dual SIM. The phone has a 3.0 inch touch screen with a QVGA resolution of 320×240 pixels, Dual-SIM (with one slot capable of hot swap)support, 1GHz processor, 512MB ROM with a 4GB microSD card inside the box, 3G, WiFi, Bluetooth and FM. The phone comes with a 3.2 megapixel rear camera. According to Nokia, the 1,200mAh battery is capable of 17hrs of talktime and 48 days of standby on single SIM, while 26 days on dual SIM. As one can conclude from the specs table, the newer Asha 501 is the clear winner, thanks to the 512MB ROM a compared to 256MB on the Asha 301, Dual SIM facility, huge battery backup of 17hrs talktime, and a better camera as well. So at almost the same price, you get much more compared to the Asha 311. The Asha 501 is expected to show up in retail and online stores soon, and Nokia have put up a suggested price of $99 which is around 5,500INR excluding taxes. The Asha 501 will make a good phone for anyone looking for exceptional battery backup with superb build, this has been Nokia’s motto since long. We would say, the 311 stands no chance against the 501 and anyone looking to buy a robust phone in the 5-6000INR range should look at the 501 as a contender. Keep following GadgetsToUse for the latest updates on the Nokia 501 from the press event currently happening in New Delhi. Yash, where did you read that the Asha 501 has 512 MB of RAM and 1 GHz of processor ? thanks for pointing out – we have corrected the specs.